Every convention has guest speakers but the Opening General Session speaker at NECA 2014 Chicago is not to be missed. Chris Gardner, who dragged himself from a life on the streets to the top of the boardroom and wrote the best-selling memoir The Pursuit of Happyness, will bring his passion to NECA attendees. Born in Milwaukee, Wisconsin in 1954, Gardner grew up in a single-parent, poverty-stricken home. Without a father in the house, Gardner spent his childhood moving between foster homes and living with his mother. Following high school graduation, Gardner joined the Navy. After his discharge from the service, he moved to San Francisco, where he found work as a medical research associate for a scientific supply distributor. In 1981 Gardner had a new responsibility, his son Christopher Gardner Jr. A new father, Gardner decided to make a dramatic change in his life. Despite lacking a college education, Gardner decided to attempt to start a career in finance. Willing to sacrifice almost anything for his new career, he quit his job and applied for training programs at brokerage firms. Through his determination, Gardner earned a spot in Dean Witter Reynolds training program. At this point, Chris Jr’s mother decided to leave Gardner but the young father fought to keep his son. Gardner later said “I made up my mind as a young kid that when I had children they were going to know who their father is and that he isn’t going anywhere.” However, the salary of a trainee was not enough to support both Gardner and his young son, and the two ended up homeless. After graduating from the training program at Dean Witter Reynolds, Gardner worked at Bear Stearns & Co. from 1983-1987 and became the company’s top earner. In 1987 founded the brokerage firm Gardner Rich from his home in Chicago with a meager $10,000. Gardner built his own stock brokerage firm into an international success adding offices in New York and San Francisco. In May 2006 Gardner released his bestselling autobiography The Pursuit of Happyness which was made into a film starring Will Smith. Smith was nominated for an Academy Award, a Golden Globe, and the Screen Actors Guild Award for his portrayal of Gardner. Today Gardner makes it his mission to help those who deal with similar issues that he did in his younger days. His philanthropic work includes a number of homeless initiatives and working on behalf of organizations such as the National Fatherhood Initiative, the National Education Association Foundation, and the International Rescue Committee. He is committed to helping others reach their full potential. 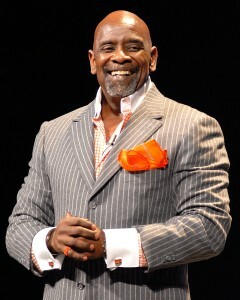 The NECA Convention is excited that Chris Gardner will be the keynote speaker for the Opening General Session at NECA 2014 Chicago. Gardner’s book will be available for purchase at the NECA booth on the show floor. He will be available to sign copies in the booth following the General Session.